A Mockbuster is to create fake low budget direct to DVD titles of huge Blockbusters, so some people will buy them buy mistake. Previously we saw the case of The Transmorphers. In this occasion, the mock movie is: Sherlock Holmes (see it in IMDB, and Rotten Tomatoes). 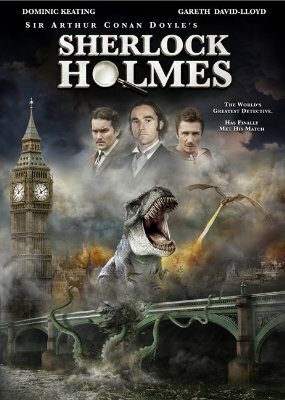 The DVD cover promises a great London adventure against Tyrannosaurus Rex (T-Rex), Dragons, and a Giant Octopus. Guy Ritchie must be either laughing or crying. Release Date: 26 January 2010, Direct to DVD, obviously. Three SFX clips from Sherlock Holmes (US-2010; dir. Rachel Goldenberg): in which the famous consulting detective must deal with an invasion of giant monsters in London.